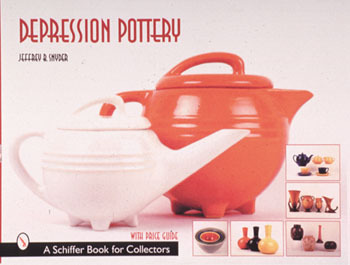 This colorful book surveys the varied and beautiful ceramic wares produced during America's Great Depression years. Over 450 color photographs display the often dazzlingly colorful and streamlined wares from the late 1920s through the early 1940s. Table, kitchen, and artware all have their place in this inclusive volume. Accompanying this colorful display is a text that provides brief histories of the various potteries striving to bring their wares to cash-strapped American consumers. Examples of each firm's manufacturer's marks are provided as well. Current values for the wares displayed are conveniently located in the photo captions. Rounding out this sweeping survey are a bibliography and index.